For years, many writers have theorized, philosophized and romanticized about the problem of Nigeria. The moralist have moralized, even, but none of this class of people have touched what I am reasonably convinced is Nigeria’s fundamental problem. 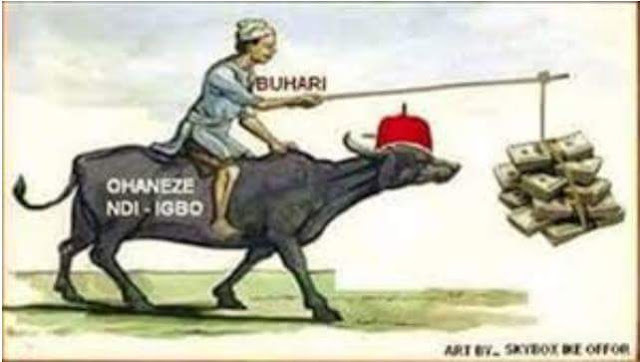 Before I proceed, I need us all to just take a moment to imagine a situation where the ArewaNorth have their own separate country where they practice their feudal system and sharia plus open Grazing of Cattle on people’s farms and killing of the farm owners while the Non-Caliphate rest of Nigeria have their own separate country where they practice democracy, rule of law, equity and peaceful religion with utmost respect for the sanctity of life! Now, imagine a situation where you bring together a people with a Value System which places cows over and above human lives, a Value System that is rooted in feudalism which basically states that some men are born to own others who must work for them and serve them, a Value System that believes men must live by the Sharia not a national law known as the Constitution or democracy….. Imagine placing these people in the same country with another set of people with a completely opposing Value System which places utmost regard to the sanctity of human lives, not cow life, a Value System that says men should live under laws enacted by them and keep their rapport with their Creator strictly personal, a Value System that believes in equity, justice and fairness as against feudalism. A BLOODY CLASH BETWEEN THE TWO IRRECONCILABLE CIVILIZATIONS! That is what you will have! One believes in Sharia and feudalism which makes it a religious duty to kill people of other faith and conquer and dominate them while the other civilisation believes in democracy and equity rooted in utmost respect for human lives. Now quote me any where, you can never have these two conflicting civilizationS in the same geographical space and expect progress of any kind. India and Pakistan were once the same country. That was a typical example of IRRECONCILABLE CIVILIZATIONS. It was a daily festival of blood until they were separated. Long years after the two aforementioned countries went their separate ways, Pakistan yet wallow in daily harvest of blood in line with its own civilization while India has continued to break boundaries in different areas of human endeavor. In a nutshell, the reason Nigeria has remained a crying shame to the comity of Nation is never because of corruption. It is not even about leadership challenges. The problem of Nigeria is simply and squarely a clash of IRRECONCILABLE CIVILIZATIONS. The continuous clash between these two civilization WILL NEVER allow for any meaningful development here. Corruption and leadership challenges are natural phenomena which can be found in every country. They don’t stop progress. They only hinder it. To ‘stop’ and to ‘hinder’ something are two different things. In 1979, the late Alex Ekwueme had one of the best academic qualifications in the whole wide world, yet, because of this clash of civilization, he wasn’t considered good enough to lead. The civilization that believes in dominating and conquering others put him as a deputy to a Shehu Shagari whose only qualifications was a high school certificate. In 2015, we had Yemi Osinbajo, a professor of law and Senior Advocate of Nigeria deputizing a Muhammadu Buhari whose ordinary WAEC certificate is still a matter for debate. In Nigeria, we operate a system of government known as Kakistocracy. And this is because one of the two conflicting civilizationS here has succeeded, through gory displays of violence, in enthroning mediocrity over merit. No country can ever move forward in an environment where merit is frowned upon. During the Biafran war, the Odumegwu Ojukwu led Biafran side was blockaded on land, air and sea and heavily bombarded by the combined forces of Britain, Russia, Egypt, Morocco and Nigeria, yet, the Biafrans did not just hold their ground for 3 years, they defied the blockade and bombardment and broke boundaries in technology by producing Ogbunigwe, refining their oil and building and repeatedly rebuilding the Uli Airstrip each time it was bombed by the enemy forces. Fifty years after the Biafran war and even with the presence of the Biafrans, the parent country, Nigeria, is still planning to manufacture pencil in the 21st century 2018!!!! It cannot refine her oil, even. Feats achieved by the Biafrans 5 decades ago when some countries of the world were still in the dark. Ask yourself, why did Nigeria not tap into the technological sophistication of the Biafrans??? It is because of this clash of civilizations. The people from the civilization that seek to oppress, own, conquer and enslave others will rather see this country go into extinction than allow people from the other civilization move her forward. The only solution to this problem is immediate and comprehensive restructuring that will allow each region manage her security and develop at her own pace. For the sake of honesty, I must add that this solution will not even put a permanent end to the problem of constant bloodshed. It will only guarantee development. The second solution which will solve this permanently is total balkanization, like what happened between India and Pakistan, to allow these two IRRECONCILABLE CIVILIZATIONS go their separate ways. In my own view, there is no other short term solution to this problem. And if we don’t move fast to apply either of these two solutions, we will all end up as casualties of this bloody clash of irreconcilable civilizations in which the one with a feudal worldview is already cruising to victory at a very grave cost. We must either restructure Nigeria IMMEDIATELY or join hands to end it before it end us all.